Shi Lei, a descendant of one of the original Kaifeng Jewish families, is now on a US speaking tour sponsored by Kulanu..
Tracing the Tribe encourages readers who live in or near the communities where he will speak to attend the program. He’s already spoken in Maryland and he’ll also be in New York, Massachusetts, Illinois, Texas, Ontario, California, Georgia and New Jersey. In his talk, Shi Lei discusses the history of this unique community, presents a slideshow and information on his community’s origins, how they preserved their identity under near-impossible circumstances and centuries of isolation isolated from the mainstream Jewish world. 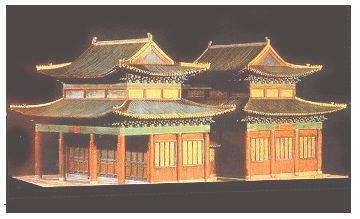 Above right is the wooden model of the ancient Kaifeng Synagogue at Beit Hatefutsoth-Museum of the Jewish People, Tel Aviv. He discusses Jewish traditions preserved through the centuries. It’s not all about the past, as he talks about the young people of his community and their desire to learn more about their origins; 18 are now studying in Israel and several have made aliyah. For more information, click here or here or view Kulanu’s slide show on the history of the Kaifeng Jews. Visit the links above for more information on Kulanu, its activities and to donate to the organization in support of those activities.